Kekaimalu, the only known living hybrid of a false killer whale and Atlantic bottlenose dolphin, or "wholphin," is alive and well at Sea Life Park on the island of Oahu. She and her daughter, Kawili Kai, who was sired by a male bottlenose dolphin, can be seen at the Park. The name "wholphin" was invented in 1985 when a 6-foot dolphin and a 14-foot false killer whale mated and produced an offspring. Prior to that mating, it was not thought possible to mate the two species. Her mother, Punahele, was an Atlantic bottlenose dolphin, while her father, I'anui, was a false killer whale. False killer whales are actually members of the dolphin family and unrelated to killer whales. Males can reach 22 feet in length and weigh as much as two tons, while females are smaller, reaching 16 feet in length. Kekaimalu ("from the sheltered ocean") was the name given to that original offspring who is now the mother of the wholphin, Kawili Kai ("blend of the ocean"). This was the third pregnancy for Kekaimalu. Both prior offspring have died—one in infancy, the other at the age of nine. Kawili Kai is 3/4 dolphin and 1/4 false killer whale. The park's training and veterinary staff spent long hours over the baby wholphin's first four months collecting data and ensuring that mom and calf were receiving the best possible care before publicly announcing its birth and development. Very energetic and animated, the baby wholphin interacted well with her mother and trainers and nursed. Early in-water interaction with the calf was part of Sea Life Park's training program, to ensure a high level of trust between calf, mother and trainers, as well as early conditioning for voluntary medical behaviors. 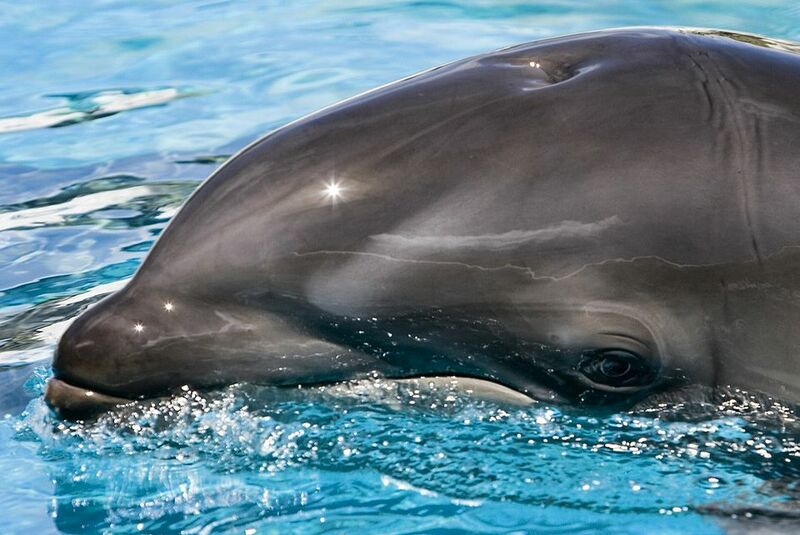 The baby wholphin displayed notable characteristics inherited from her hybrid lineage. The coloration is a perfect blend between the light gray of the bottlenose dolphin and black of the false killer whale. For the first months, the calf relied fully on her mother's milk. She nursed intermittently throughout the day and night, with all nursing taking place underwater. Nursing continued up to about nine months before the calf began sampling her mother's food. Only months after birth, the calf was the size of a one-year-old bottlenose dolphin. At a little over one year of age, the calf was completely weaned. Sea Life Park is located on the Hawaiian Island of Oahu. The world-famous marine attraction offers a variety of shows, exhibits, and educational programs for all ages. You can visit the Shark Cave, a 300,000–gallon aquarium with native Hawaiian sharks including sandbar sharks, whitetip reef sharks, and a blacktip reef shark. You can even go underwater with them. There is a multitude of opportunities to get close up and personal with dolphins and sea lions. Some of the encounters allow you to get into the water and others permit you to touch dolphins and see them without getting wet. Sea Life Park is open 365 days a year. Daily admission includes a fun-filled day of marine life shows and exhibits nestled beneath the Ko'olau mountain range overlooking Makapu'u Beach and Rabbit Island.